Embark on an evening of fun at India‘s Italian Ices Magical Unicorn Party. Dress up for the photo booth sponsored by Little Nest Portraits of Montclair. Participants will receive a Unicorn Headband and have a chance to try on items from the party closet. Make glitter unicorn slime. Enjoy pizza and unicorn themed sweet treats, including an Italian Ice from kidpreneur India Jolie. Check out the Party Expo Boot,h and be inspired with lots of fun ideas and resources for your next party or event. Camp out under the stars at Sunrise Beach. Families can enjoy a campﬁre, storytelling, s’mores, and more at this popular, overnight event. Rain date is June 23. Registration is required. Head on over to Green Village Road & Main Street for the first in the series of free concerts in Madison! Grab a scoop from McCool's, bring a blanket and listen to some music as the sun goes down. 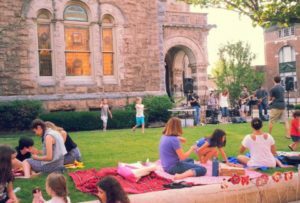 The lawn outside the museum serves as an informal stage for this series of Friday night concerts throughout the summer. Bring a blanket and a picnic dinner. Celebrate the 11th Annual Fairy Day at The Frelinghuysen Arboretum. Welcome these wee folks into the garden by designing and creating a magical, miniature garden home made from all natural materials. Enjoy delicious treats and live music, and create a fairy themed craft to take home. At 3 p.m., join a colorful, musical procession around the gardens to marvel at the finished projects. Feel free to wear your best fairy finery. Perfect for fairy believers, both young in age and young at heart!. Rain date is Sunday, July 1st.